We've been on a roll getting stuff done around here, and the universe must have decided we had violated the two steps forward one step back rule. Bam! 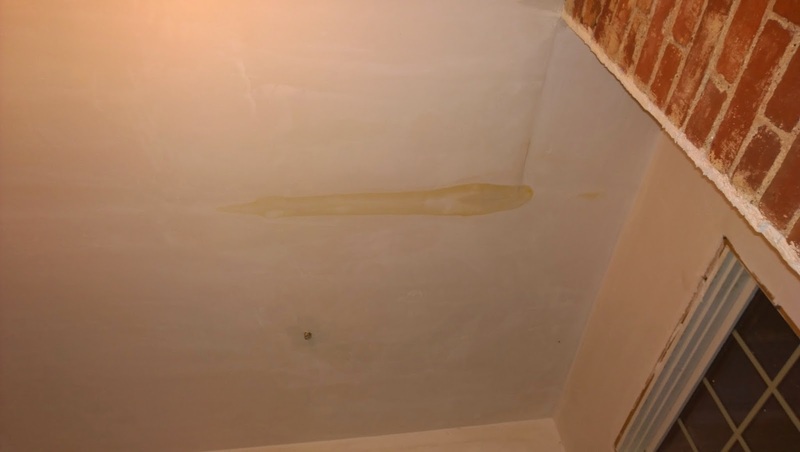 Roof leak! When we redid the entire roof on the main house 4 years ago, there weren't many places it wasn't leaking (but because we started work in a very cold and snowy winter we had to do the electrical first, how's that for hilarious?). Our roof was Buckingham (black and sparkly from it's quartz content) slate, which is perhaps the most desirable slate in North America. Instead of making repairs, the previous owners had been tarring the leaks for the past 60 years. So we went from slates that should have been nearly 100% salvageable, to being able to save about 50%. And why you ask are my black slates red? Your amateur slate lesson for the day: A good slate like a Buckingham will last nearly indefinitely with proper care, and even a cheap slate that's installed well should last a century. The steeper a roof, the longer the slates will last because water and dirt shed off well. 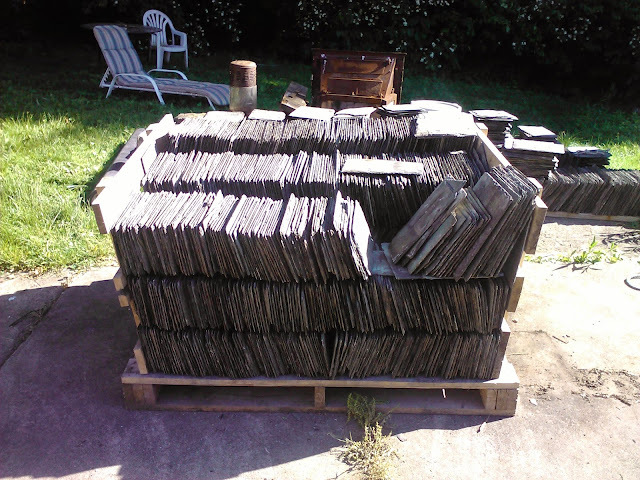 The materials that make up a slate roof will, in most cases, fail before the slates themselves do. When that happens, the slates are carefully removed, gutters, valleys and flashing are repaired, and the slates relaid. In this scenario, you may have to find a square or two to account for loss and rotted slates. Doing this on a big house, even with copper everything, will cost about the same as a new shingle roof and last about a century. But in our case, tar.... Tar is bad. It is the destroyer of slates - it holds water and heats up, rotting the slate, and can't be removed. And it doesn't even really stop leaks that well. The slate was really the biggest hangup on us buying the house. For what it would cost to properly restore the roof we could have finished the exterior. That was an incredibly tough pill to swallow and we didn't feel we were up to the challenge. 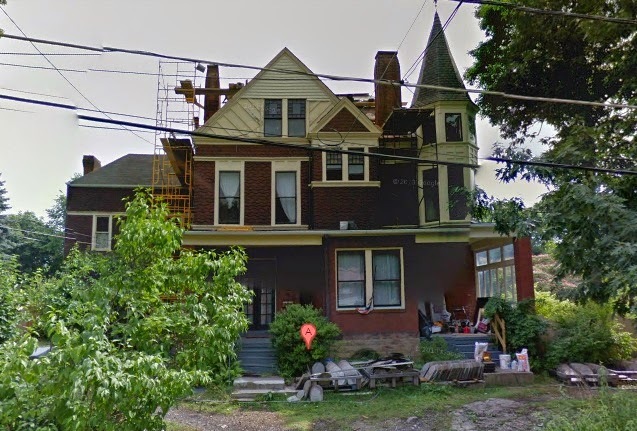 If we didn't buy the house, not only would it not get a slate roof, it was facing demolition. If someone else did save the house, they certainly weren't going to put slate back up. The house had already lost so much, that losing it's slate would just be another nail in it's coffin. And most of the other big homes had lost their slates - and it was an obvious loss. We went with slate. Or rather, mostly slate. In every restoration there is room for compromise. In this case, we did as much of the front of the roof in our original Buckingham slate as possible, putting enough aside to do just the front of the kitchen addition when that roof fails. This is what passerbys see, and what we see coming home, so it was obviously the priority. 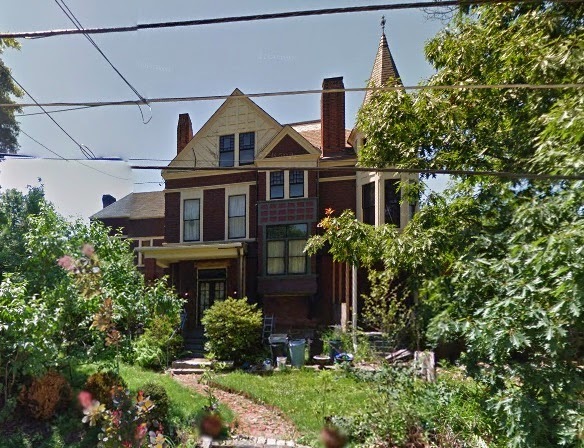 Our 1907 Queen Anne had an original slate roof. When it needed repair, many years after it was installed, roofers did not have knowledge of how to correctly repair, thus talked the owner into putting in an asphalt shingle roof. The slate roof did not require ventilation as the slate expanded and contracted on its own with the weather. The roofers who did not know how to repair slate also didn't put in any ventilation for the asphalt roof, which was necessary and caused the shingles to bake and quickly begin to leak. When we bought the house we had to re roof the house but also included the necessary ventilation. I just wished that the slate had been kept and repaired properly. The roofer that removed the slate came by after we bought the house and told me that he had removed the slate for the original owner and wanted to know if we wanted him to re roof the house. After seeing the problems he created we didn't want him back on the roof. It's funny, we had nearly the same thing happen. The "handyman" who tarred our roof in the years it sat empty was confounded as to why we didn't hire him to do the work on the house. I swear some people don't have an once of intelligence to them. *Groans* So sorry you're having to go through this, though I guess it's not surprising with the weather we've been having. Interesting it should be the shingle side. Wasn't there a guarantee with that? My house used to have slates. I sometimes find them (and their nails) when I'm digging the front garden. Wish they were still on the roof. Until you can get it fixed, you know the old string trick, don't you? 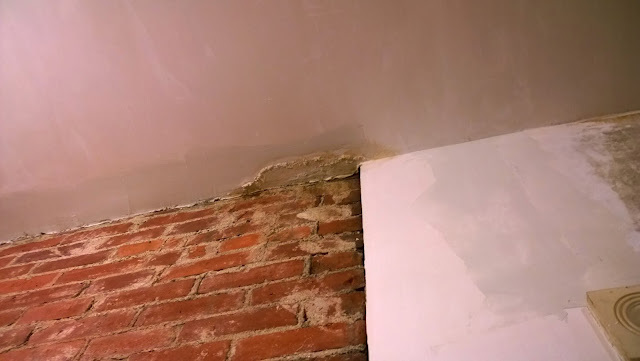 Drill a relief hole, then tape or staple a piece of string next to it so the water flows down into a bucket instead of all over the floor or taking down your ceiling. Glad you're still at it, and that good stuff is getting done, despite the roof issues. That string trick is brilliant. In this case though the failure seems to be across the length of one rafter. Bizarre to say the least. The shingles have a great guarantee, but I'm sure the issue was with the installation, not the materials. Oh well, with spring finally in the air our roofer should be able to get up there and get it fixed sometime this week. Fascinating post! Thanks for all the detail!